Take a little more transit and eat a little less meat — two things you can do to reduce your environmental impact. In this installment of Meatless Mondays with Metro, I compare the Impossible Burger and the Beyond Burger. Both are plant-based burger patties that claim to look, feel and taste like a regular meat patty. But only one, in my humble opinion, is worth spending money on. In a previous post, I reviewed the VG Beyond Burger, which is available at Veggie Grill. If you don’t want to click the link, here’s a quick recap of how I felt about it: it’s delicious. It’s soft and juicy, and it’s a great choice for a vegan or vegetarian who occasionally misses the taste of a regular hamburger. Bonus: their new seasonal Super Rica Burger is also fantastic. Umami’s Impossible Burger. Notice the crispy edges. The fries were extra. Photo: Anna Chen/Metro. 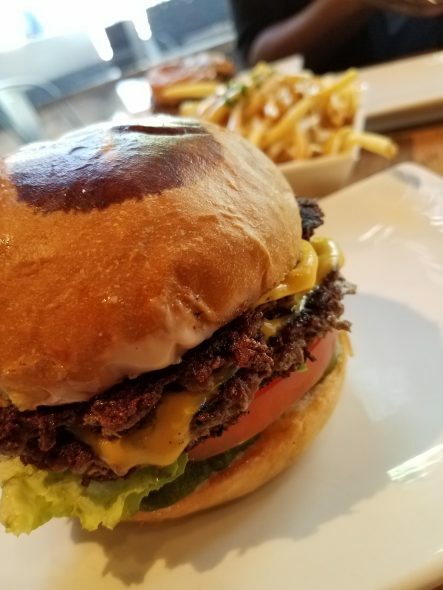 Up until recently, I hadn’t had the chance to try the Impossible Burger because it was only available at Crossroads Kitchen. I’d been meaning to make the trip, but then Umami Burger started serving it and Umami is more transit-friendly for me, so to Umami I went. I ordered the Impossible Burger, bit into it and felt…disappointed. The burger just didn’t taste like anything. The pickles were nice, but the patty itself was an utterly unmemorable, weirdly crunchy, and dry. And to make sure it wasn’t just me, I spoke to a friend who had eaten the Impossible Burger at Crossroads. Her burger was also bone dry. At $16 a burger with no sides, the Umami Impossible Burger really isn’t worth it. (Note: it’s also not vegan because there’s cheese on it, although I guess you can ask for the burger without cheese. I wouldn’t, though, since it’s tasteless enough.) The Crossroads Impossible Burger is slightly cheaper at $14 and it comes with a side of truffle fries. But the clear winner to me is the VG Beyond Burger, which costs $13, comes with a side of fries and actually tastes satisfying. If you’ve tried both burgers, let me know what you think! And if you have other recommendations for vegan/veggie restaurants, let me know in the comments. I wonder if it’s the beyond burger patties they sell at Grow. Have you tried San Diego’s the Abbot’s butcher plant based meats? I had the opposite reactions. Beyond was greasy and had no meat-like flavor. Impossible was much meatier taste-wise. Beyond meat burger is insane. I go through 4 or 5 packages a week. It’s one of the best products I have consumed. The trick I use, lightly coat pan or grill/griddle with peanut oil, then cook 3 minutes per side, then I put some water around it and cover it for a few minutes to steam it. Absolutely best burger ever. Great tip, I haven’t tried cooking it at home yet. Thanks!